Waterless toilet systems like the ones shown here are available in both electric and non-electric models. 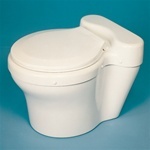 The Composting Toilet Store also offers self contained waterless toilet units. A self contained waterless toilet features a composting drum contained within the toilet itself. The waterless toilets shown on this page feature a central composting system that is installed below the toilet fixture in the bathroom. For central systems with a waterless toilet, a 10" diameter waste pipe connects the toilet to the central composting unit below. Please be sure to note that the central composting units and waterless toilet fixtures are sold separately! How can you be sure that our composting systems operate without odor? Because they're certified by the NSF! The NSF, or National Sanitation Foundation, has independently tested every unit on our website, and has certified them to comply with NSF/ANSI Standard #41, the world's only standard for composting waste treatment systems. What does this really mean? It means that all our units are NSF certified to operate without odor and produce a clean, dry compost that is safe to use on your flower gardens and landscaping. For more detailed information, please feel free to contact us. We are happy to supply a copy of the testing report and compliance certification documents from the NSF. This information can be especially helpful if you are trying to get one of our systems approved by your local city building department or prove code compliance of one of our units. Odorless operation of all our composting systems is ensured in two ways. First, the Bio-Drum where composting takes place is the ideal environment for aerobic composting, encouraging the growth of aerobic bacteria. Unlike anaerobic bacteria which produce smelly methane gasses as a byproduct of breaking down waste, aerobic composting bacteria produce only oxygen as they do their job. Furthermore, aerobic bacteria are much more efficient at breaking down waste, usually completing the composting process about five to ten times faster than anaerobic bacteria. No wonder a composting system like ours is far superior to a septic system! With all our systems, it's important that you remember to rotate the drum every 2-3 days while the unit is in use. This ensures that the compost is well aerated, providing the necessary oxygen for aerobic composting to take place. Second, all units feature either a fan assembly or a 4" vent stack to maintain a constant air flow through the unit. This constant flow of air keeps the unit under a partial vacuum at all times, ensuring odorless operation. For more information, please see our page of Frequently Asked Questions (a link can be found at the top of this page). If you have any questions about the products you see here, or anywhere else on our website, please feel free to contact us. We're available by phone at 800-690-0132 during regular business hours or by email anytime. We're always happy to answer questions, take orders by phone, or check the status of an existing order. We look forward to talking to you!